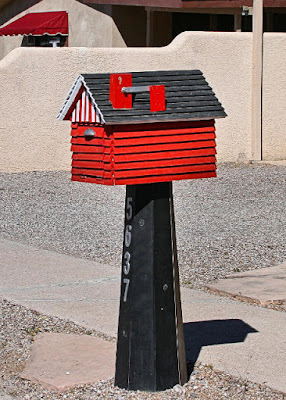 Some mailboxes as clever as this barn-shaped box (red sides with white stripes over the door and a black shingled roof) are commercially-made. We tend to avoid those and lean toward one-of-a-kind mailboxes. This one — which David Aber found on March 10th — looks to me like it's made of wood and is just a bit irregular.